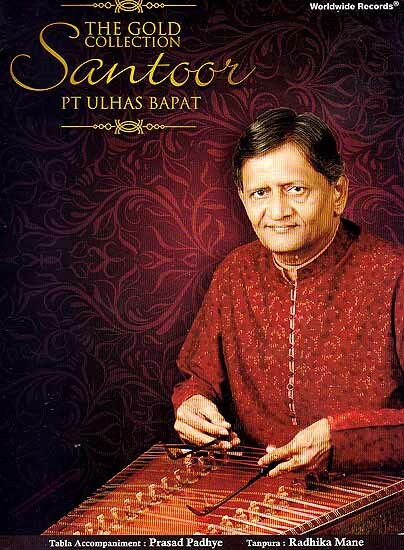 Pandit Ulhas Bapat is an outstanding Santoor player of the country today. A highly accomplished musician he has made his mark in the field of music with his artistry and creativity. Pandit Bapat had displayed his innovative spirit in a unique manner and raised the Santoor to the level of melodic instruments like the sitar and the sarod, Pt. Bapat’s specialty in his unique technique of tuning the Santoor in the chromatic fashion. This is a major innovation which enables him to handle the instrument with a lot of freedom. He can produce the meend like a sarod player and also roam about without any restriction or inhibition in the realm of rages. Pt. Ulhas Bapat believes in the process of constant creation and experimentation. He has created new ragas like ‘Gorakh Kans’ ‘Amrut Ranjani’, ‘Parijat’, Poornanad and Abhogini. Various sound forms fascinate a Sensitive musician Pt Bapat they inspire him to create new ragas. Composing different Bandishes taking into account the special characteristics of the Taal & Raga is his special attribute as a musician. One cannot find similarly patterned compositions in his performance. Each Raga has its own personality and character which he absorbs and moulds the sound designs accordingly. He is a “Top” grade Artiste of all India Radio ad a regular performer over the all India Radio and television channels. Pt. Ulhas Bapat had been internationally acclaimed a versatile musician. He has kept up a steady stream of concert appearances all over Indian interspersed with concert tours abroad to countries such as the U.S Canada, U.K. Germany and Italy, Switzerland – Winterthur, China, Belarus, Finland. In August 2008 the Goethe Institute and Maxmuller Bhavan had invited him to perform in Pakistan as a part of the series Dialogue through Music. He was also invited to perform at the presidents meets 2000 in china with the renowned violinist Dr. L. Subramanium which speaks volumes for the respect he commands as a musician. •	Nata-Bhairav – A morning Raga, combination of Shuddha Nat & Bhairav” Artist has played Aalap-unfolding of raga. Jod with tempo but without any rhythmic cycle and Zada faster patterns. •	Kirwani – Karnatak tradition Raga played in the evening in North Indian tradition. Presented few Aalaps followed by Vilambit Roopak ( Seven Beats) and Teental again an example of artist’s creativity. •	Saraswati – Karnatak tradition Raga played in the evening. Few Aalaps and played in Nine Beats taal Pratik created by artiste followed by ektaal (Twelve Beats). •	Shadow – Unique example of artist’s innovative approach & Vision towards melody Shadow which owes its origin to the traditional raga Hansadhwani However Pt. Bapat had made a deft use of two tonics as a title shadow and created a wonderful design of sound patterns. •	Zinjoti – Belongs to Khamaj starts with Aalap followed by lilting composition in Teentaal ends as a crescendo in faster tempo in interaction with Tabla. Pandit Ulhas Bapat is an outstanding santoor player of the country today. A highly accomplished musician he has made his mark in the field of music with his artistry and creativity. Pandit Bapat had displayed his innovative spirit in a unique manner and raised the santoor to the level of melodic instruments like the sitar and the sarod.